Quin Blue at the Pride Centre on March 27. Blue has been the coordinator for the centre since its opening. Algonquin’s Pride Centre opened up for the Woodroffe campus in September 2016 and has since been a safe haven for students in the LGBTQ community. When the Pride Centre opened on the ground floor of B-building, Quinn Blue jumped at the chance to be the coordinator for the centre and has been ever since. Originally, as a student at the University of Ottawa he had run their pride centre before graduating and moving to Algonquin. Now, Blue organizes the events, runs the drop in space, provides peer support and finds and orders resources at the centre. Blue-along with some volunteers at the centre-have worked to influence and create a safe space. “When I saw this position come up for the Pride Centre, I thought it was a really exciting opportunity. An opportunity to work with some amazing students. I’ve been really lucky to be able to be a part of this wonderful community,” Blue said. The centre, Blue finds, is a place where a lot of students can find and make important connections and friendships. The campus is a big place with events happening all the time and the Pride Centre works to get their events known as well. The centre makes sure they advertise their events on screens, posters, through the Students’ Association website and their Facebook. Over time, the centre has gradually found students getting to know about them more and more. One such event, that they do two or three times a semester, is the Gender Blender. The event is a transgender and non-binary social that creates a place for people involving movies, snacks and games. Usually Blue tends to let the students choose what they want to do during the event. “It’s a space for folks who are part of that sort of broad category of trans and/or non-binary, to have a safe, supportive space where they don’t have to explain themselves or justify themselves. They can be themselves and have a place to build friendships,” Blue said. Like Gender Blender, the Pride Centre has recurring events while changing some of the activities that they try to have once a week. 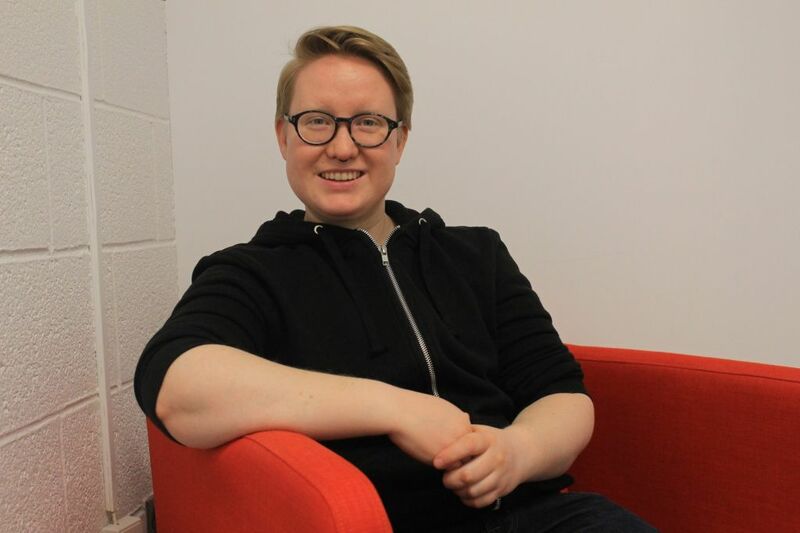 Blue has found that since the Pride Centre opened up there has been effort to support the centre and integrate the LGBTQ community into the college, even if there is still some work to be done. So far, they’ve been content with their space while facing the debate of location. The area is still close enough to some high traffic but remains slightly tucked away to uphold privacy. While being slightly veered away from the main hall. They keep a rainbow painted pillar and stretched arrow to guide people to the centre to try to combat the difficulty finding it. Blue describes the centre as a “place where you can bring your whole self” no matter the day someone’s had, they can come and be with people who celebrate who they are and encourage each other. He agreed that it can be intimidating the first time visiting the space, not knowing how other students may react. The students, in response, have come to make sure anyone feels welcome. The centre has since worked to make the college more inclusive by raising the rainbow flag during Pride Week and having their first pride walk with the Students’ Association at last summer’s pride parade. Together, they have gradually made a difference for students in and beyond the safe space that is the Pride Centre. Algonquin’s Pride Centre is creating a safe space for the LGBTQ community Reviewed by Jennifer Leblanc on April 10, 2019 .